We’re Going to PAX South 2016! 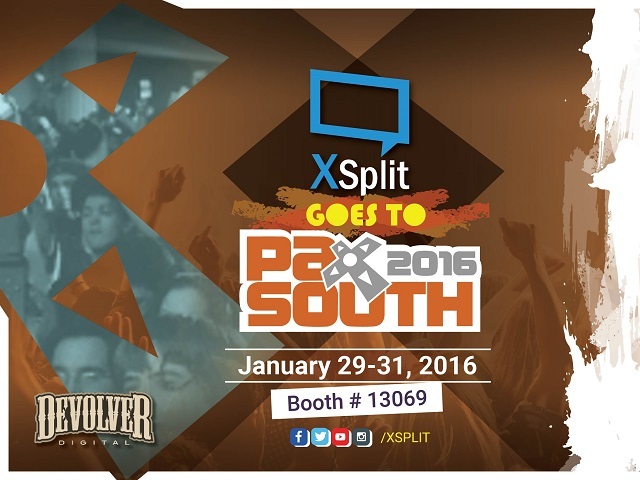 Blog > We’re Going to PAX South 2016! We are proud to announce the first event we are going to attend in 2016 will be one of the fast growing video game conventions, PAX South! The convention will be on January 29 - 31 2016, and we will be having our own booth (Booth 13069) so make sure to check us out. We will be demonstrating and live streaming various games with Devolver Digital for all three days at the convention! Once again, we will be having Chris Slight as our main host who will be talking with the developers of these awesome games that we will be showcasing! So come to our booth to check out these video games, or just say hi to get some XSplit goodies that will surely be in abundance. Chris Slight is a U.K based Video games TV Presenter who frequently makes appearances on a variety of TV broadcasts as the resident video games expert and journalist for channels such as CNBC, Sky News & Video Game Nation, as well as also presenting on live broadcasts from the show floor at London Comic Con, and being regular on Ginx TV. If you’re not coming to PAX South, you can tune in to twitch.tv/xsplit to check out the games we are going to be showcasing live. We will also be having a massive, and we really mean massive giveaway on social media during the event week so make sure to follow us on Twitter, Facebook and Instagram so you don't miss it out.